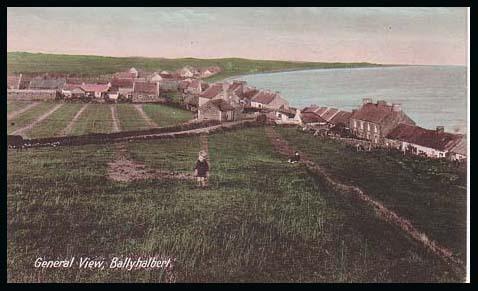 These lovely old postcards on the left of Ballyhalbert was kindly sent to me by Pat McGowan Bartos This lovely old postcard of Shore St, Ballyhalbert is from Noel Lavery. Ballyhalbert is a small village on the Irish Sea coast. Its name seems to be a c roouption of Ball- Thalbot or Talbotstown derived from the Talbot family which occupied this area after the conquest c. 1300. The parish paid tithes to Black Abbey in 1615. In 1659 there were 12 English/ Scots & 10 Catholic families. There is an ancient Anglo-Norman motte just behind the village. In 1836 it was described as being without any importance and not being a post town. The inhabitants were mostly fishermen. The other trades were 4 spirit dealers and grocers and one smith. It is an ancient town but has been diminishing in importance. It had 45 cabins, 18 of which were slated and eleven 2 storey houses of stone with small windows which would not have admitted much light. There weren't any fairs or markets held in the village. The people were described as respectable and industrious with no decided cleanliness about them or their houses. They used turf as fuel for their fires. There was a court held in the village every 9 weeks and a leet court held every year in April. There wasn't a police constable but there were 8 coastguard men & one chief officer. No illicit distilling, no smuggling, no houses were insured & no dispensary. There were two corn mills here in 1836. There is an ancient standing stone nearby. There is a village graveyard. 27 May 1848 a public works program was instigated for famine relief with the upgrading of the road from Portaferry to Ballyhalbert (FCD p8). There was a Coastguard Station here in 1863. Click here for information about churches in the town & parish. Click here for information about schools in 19th century. There was a church just south of the village in 1306 called Talbetona after the Talbot family who came here with the Normans. It was repaired in 1622 then fell into disuse. The local parishioners worshipped at Inishargy Church until a new church was built in Ballyesborough in 1850. The new 'McVeigh Hall ' was named after James McVeigh of Portavogie & family.